Autumn (also known as fall in North American English) is one of the four temperate seasons, the transition from summer into winter. In the temperate zones, autumn is the season during which most crops are harvested, and deciduous trees lose their leaves. It is also the season where days rapidly get shorter and cooler, the nights rapidly get longer, and of gradually increasing precipitation in some parts of the world. 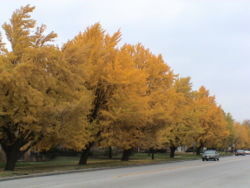 Astronomically, some Western countries consider autumn to begin with the September equinox (around September 23) in the Northern hemisphere, and the March equinox ( March 21) in the southern hemisphere, ending with the December solstice (around December 21) in the Northern hemisphere and the June solstice ( June 21) in the Southern hemisphere. Such conventions are by no means universal, however. An exception to these definitions is found in the Irish Calendar which still follows the Celtic cycle, where Autumn is counted as the whole months of August, September and October. In Chinese astronomy, the autumnal equinox marks the middle of autumn, which is deemed to have begun around the time of Liqiu (around August 7). On the other hand, meteorologists count the entire months of March, April and May in the Southern hemisphere, and September, October and November in the Northern hemisphere as autumn. Albeit the days begin to shorten after the summer solstice, it is usually in September (Northern Hemisphere) or March (Southern Hemisphere) when twilight becomes noticeably shorter and the change more abrupt in comparison with the more lingering ones of summer. 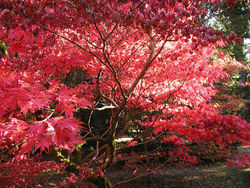 Autumn colours at Westonbirt Arboretum, Gloucestershire, England. Autumn is often defined as the start of the school year, since they usually begin in early September or early March. Either definition, as with those of the seasons generally, is somewhat flawed because it assumes that the seasons are all of the same length, and begin and end at the same time throughout the temperate zone of each hemisphere. Aestuat Urbanus, Autumnat Bartholomaeus." . In alchemy, Autumn is the time or season when the operation of the Philosopher's stone is brought to maturity and perfection . Personification of Autumn (Currier & Ives Lithograph, 1871). 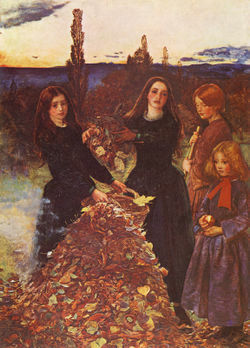 Autumn's association with the transition from warm to cold weather, and its related status as the season of the primary harvest, has dominated its themes and popular images. 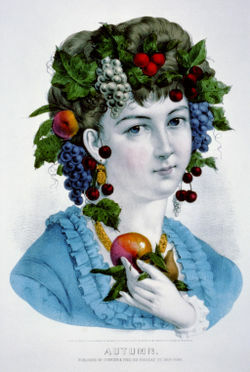 In Western cultures, personifications of Autumn are usually pretty, well-fed females adorned with fruits, vegetables and grains that ripen at this time. Most ancient cultures featured autumnal celebrations of the harvest, often the most important on their calendars. Still extant echoes of these celebrations are found in the late-Autumn Thanksgiving holiday of the United States, the Jewish Sukkot holiday with its roots as a full moon harvest festival of "tabernacles" (huts wherein the harvest was processed and which later gained religious significance), the many North American Indian festivals tied to harvest of autumnally ripe foods gathered in the wild, the Chinese Mid-Autumn or Moon festival, and many others. The predominant mood of these autumnal celebrations is a gladness for the fruits of the earth mixed with a certain melancholy linked to the imminence of harsh weather. Remembrance of ancestors is also a common theme. This view is presented in Keats' poem ' To Autumn' where he describes the season as a time of delightful growth, a seemingly endless time of 'fruitfulness'. We might also think of Yeats' poem ' The Wild Swans at Coole' where the maturing season that the poet observes symbolically represents the poet's ageing self. Like the natural world that he observes he too has reached his prime and now must look forward to the inevitability of old age and death. Paul Verlaine's "Chanson d'automne" ("Autumn Song") is likewise characterized by strong, painful feelings of sorrow. Especially in the US, Autumn is also associated with the Halloween season, and with it a widespread marketing campaign that promotes it. The television, film, book, costume, home decoration, and confectionery industries use this time of year to promote products closely associated with such holiday, with promotions going from early September to 31 October, since their themes rapidly lose strength once the holiday ends. For the American film industry, the autumn season, which begins on the weekend following Labor Day and ends in early November, is the shortest and least profitable season of the movies. It follows the season of summer " blockbusters" and precedes the crowded end-of-year schedule of movies intended for award consideration. Although autumn coloration occurs wherever deciduous trees are found, colored autumn foliage is particularly noted in three regions of the world: most of Canada and the United States; a small area of central South America; and Eastern Asia, including China, Korea, and Japan. Eastern Canada and the New England region of the United States are famous for the brilliance of their "fall foliage," and a seasonal tourist industry has grown up around the few weeks in autumn when the leaves are at their peak. 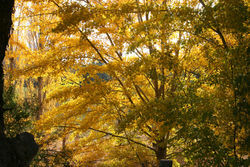 Some television and web-based weather forecasts even report on the status of the fall foliage throughout the season as a service to tourists. Fall foliage tourists are often referred to as " leaf peepers". Fall is an alternative English word for the season of Autumn. In use now only in North American English, the word traces its origins to old Germanic languages. The exact derivation is unclear, the Old English fiæll or feallan and the Old Norse fall all being possible candidates. However, these words all have the meaning "to fall from a height" and are clearly derived either from a common root or from each other. 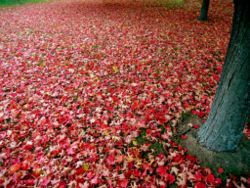 The term only came to denote the season in the 16th century, a contraction of Middle English expressions like "fall of the leaf" and "fall of the year". Autumn comes from the Old French automne, and ultimately from the Latin autumnus. There are rare examples of its use as early as the 14th century, but it became common only in the 16th, around the same time as Fall, when the two words appear to have been used interchangebly. During the 17th century immigration to the English colonies in North America was at its peak and the new settlers took their language with them. While the term Fall gradually obsolesced in Britain, it became the preferred term in North America, at least in conversation. Before the 16th century Harvest was the term usually used to refer to the season. However as more people gradually moved from working the land to living in towns (especially those who could read and write, the only people whose use of language we now know), the word became to refer to the actual activity of reaping, rather than the time of year, and Fall and Autumn began to replace it.